The dsp.Interpolator System object™ interpolates values between real-valued input samples using linear or polyphase FIR interpolation. Specify which values to interpolate by providing a vector of interpolation points. An interpolation point of 1 refers to the first sample in the input. To interpolate the value halfway between the second and third sample in the input, specify an interpolation point of 2.5. Interpolation points that are not within the valid range are replaced with the closest value in the valid range. Create the dsp.Interpolator object and set its properties. interp = dsp.Interpolator creates an interpolation System object, interp, to interpolate values between real-valued input samples using linear interpolation. interp = dsp.Interpolator(Name,Value)creates an interpolation System object, interp, with each specified property set to the specified value. Enclose each property name in single quotes. 'Property' — Specify the interpolation points through the InterpolationPoints property. 'Input port' — Pass the interpolation points as an input to the System object algorithm. Interpolation points, specified as a vector, matrix, or an N-D array. The valid range of the values in the interpolation vector is from 1 to the number of samples in each channel of the input. If you specify interpolation points outside the valid range, the object clips the point to the nearest point in the valid range. For example, if the input is [2;3.1;-2.1], the valid range of interpolation points is from 1 to 3. If you specify a [-1;1.5;2;2.5;3;3.5] vector of interpolation points, the interpolator object clips -1 to 1 and 3.5 to 3. This clipping results in the interpolation points [1 1.5 2 2.5 3 3]. For details on the dimension of the interpolation points array and how that influences the dimension of the output, see the tables in the ipts input of the System object. This property applies only when you set the InterpolationPointsSource property to 'Property'. 'Linear' –– The object interpolates data values by assuming that the data varies linearly between samples taken at adjacent sample times. 'FIR' –– The object uses polyphase interpolation to replace filtering (convolution) at the upsampled rate with a series of convolutions at the lower rate. If the input has insufficient low-rate samples to perform FIR interpolation, the interpolator object performs linear interpolation. For more details, see the FilterHalfLength property. For a filter half-length of P, the polyphase FIR subfilters have length 2P. FIR interpolation always requires 2P low-rate samples for every interpolation point. If the interpolation point does not correspond to a low-rate sample, FIR interpolation requires P low-rate samples below and P low-rate samples above the interpolation point. If the interpolation point corresponds to a low-rate sample, the 2P-sample requirement includes the low-rate sample. If the input has less than 2P neighboring low-rate samples, the interpolator object uses linear interpolation. For example, for an input [1 4 1 4 1 4 1 4], upsampling by a factor of 4 results in equally spaced interpolation points, InterP = [1:0.25:8]. The points InterP(9:12) are [3.0 3.25 3.5 3.75]. If you set FilterHalfLength to 2, interpolating at these points uses the 4 low-rate samples from the input with indices (2,3,4,5). If you set FilterHalfLength to 4, the interpolator object uses linear interpolation, because the input does not have enough low-rate samples to perform FIR interpolation. The longer the FilterHalfLength property, the better the quality of the interpolation. However, increasing the filter half-length increases computation time and requires more low-rate samples below and above the interpolation point. In general, setting the FilterHalfLength property between 4 and 6 provides a reasonably accurate interpolation. This property applies only when you set the Method property to 'FIR'. Upsampling factor, specified as an integer scalar greater than 0. An upsampling factor of L inserts L – 1 zeros between low-rate samples. Interpolation results from filtering the upsampled sequence with a lowpass anti-imaging filter. The interpolator object uses a polyphase FIR implementation with InterpolationPointsPerSample subfilters of length 2P, where P is the value you specify in the FilterHalfLength property. For nL low-rate samples in the upsampled input, where n=1,2,..., the interpolator object uses exactly one of the InterpolationPointsPerSample subfilters to interpolate at the points nL+i/L, where i = 0, 1, 2, …, L – 1. If you specify interpolation points that do not correspond to a polyphase subfilter, the object rounds the point down to the nearest interpolation point associated with a polyphase subfilter. Suppose you set the InterpolationPointsPerSample property to 4 and interpolate at the points [3 3.2 3.4 3.6 3.8]. The interpolator object uses the first polyphase subfilter for the points [3.0 3.2], the second subfilter for the point 3.4, the third subfilter for the point 3.6, and the fourth subfilter for the point 3.8. Bandwidth to which the interpolated output samples must be constrained, specified as a real scalar greater than 0 and less than or equal to 1. A value of 1 equals the Nyquist frequency, or half the sampling frequency, Fs. Use this property to take advantage of the bandlimited frequency content of the input. For example, if the input signal does not have frequency content above Fs/4, you can specify a value of 0.5 for the Bandwidth property. 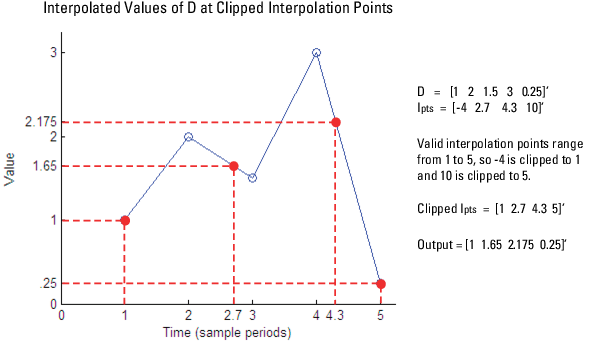 interpOut = interp(input) outputs the interpolated sequence, interpOut, of the input vector or matrix input, as specified in the InterpolationPoints property. Each column of input is treated as an independent channel of the input. interpOut = interp(input,ipts) outputs the interpolated sequence as specified by ipts. To specify the interpolation points, set the InterpolationPointsSource property to 'Input port'. Input that is interpolated by the object, specified as a vector, matrix, or N-D array. Interpolation array IPts, specified as a vector, matrix, or N-D array. The interpolation array represents the points in time at which to interpolate values of the input signal. An entry of 1 in IPts refers to the first sample of the input, an entry of 2.5 refers to the sample halfway between the second and third input sample, and so on. In most cases, when IPts is a vector, it can be of any length. Valid values in the interpolation array IPts range from 1 to the number of samples in each channel of the input. For instance, given a length-5 input vector D, all entries of IPts must range from 1 to 5. IPts cannot contain entries such as 7 or –9, because D does not have a seventh or ninth entry. The algorithm replaces any out-of-range values in IPts with the closest value in the valid range (from 1 to the number of input samples). Then it performs the interpolation using the clipped version of IPts. Because D has four samples, valid interpolation points range from 1 to 4. The algorithm clips interpolation point 10 down to to 4 and the point –3 up to 1. The result is the clipped interpolation vector IPtsClipped = [4 2.6 1]'. If IPts is an array, the object applies IPts across the first dimension of an N-D array, resulting in an N-D array output. If IPts is a vector, the object applies IPts to each input vector (as if the input vector were a single channel), resulting in a vector output with the same orientation as the input (row or column). The following tables summarize how the object applies the interpolation array IPts to all the possible types of inputs. The table also shows the resulting output dimensions. This table describes the behavior when InterpolationPointsSource is set to 'Property'. Not applicable. Object copies input vector. This table describes the behavior when InterpolationPointsSource is set to 'Input port'. Interpolated sequence, returned as a vector, matrix, or N-D array. The dimension of the output depends on the dimensions of the input and the interpolation points array. For more details on the dimensions, see the tables in ipts. Note: If you are using R2016a or earlier, replace each call to the object with the equivalent step syntax. For example, obj(x) becomes step(obj,x). The interpolation points at indices 1 to 5 and 25 to 29 do not have enough low-rate samples surrounding them to use FIR interpolation with the specified filter length. Therefore, the interpolator object uses linear interpolation instead. Interpolate a sum of sinusoids with FIR interpolation, and with 'Input port' as the source of interpolation points. The dsp.Interpolator object with the Method property set to 'FIR' models a polyphase FIR Interpolator. The polyphase implementation splits the lowpass FIR filter impulse response into several subfilters. Each subfilter occupies a specific narrow frequency band. This example shows how to determine the polyphase subfilters. The default upsampling factor and the default polyphase half-length is 3. Using these values, design the linear phase FIR filter by using the intfilt function. The filter returned is of length 2 * P * L -1, where P is the upsampling factor and L is the filter half length. The filter needs 2*P*L coefficients. Prepending a zero does not affect the filter magnitude. Each column of PolyPhaseCoeffs is a polyphase subfilter. In the linear interpolation mode, the algorithm interpolates data values by assuming that the data varies linearly between samples taken at adjacent sample times. Suppose the input signal is D = [1 2 1.5 3 0.25]' . The left plot shows the samples in D and the right plot shows the linearly interpolated values between the samples in D.
When the interpolation points are out of range, the algorithm clips the invalid interpolation points. Consider an input signal, D = [1 2 1.5 3 0.25]' , and an interpolation vector, IPts = [-4 2.7 4.3 10]'. The interpolated output is given by [1 1.65 2.175 0.25]'. In the FIR interpolation mode, the algorithm interpolates data values using an FIR interpolation filter. The FIR filter is implemented using a polyphase structure. A polyphase implementation splits the lowpass FIR filter impulse response into a number of different subfilters. The table describes the decomposition of an 18-coefficient FIR filter into 3 polyphase subfilters of length 6, the defaults for the FIR interpolator object. An upsampling factor of L inserts L – 1 zeros between low-rate samples. Interpolation results from filtering the upsampled sequence with a lowpass anti-imaging filter.